Invent Your Own World-Wise Tossing Games! Enrich geography, history, literature & social studies. Locate and label bodies of water, countries, trade routes, etc. Features no printed words -perfect for assessments. 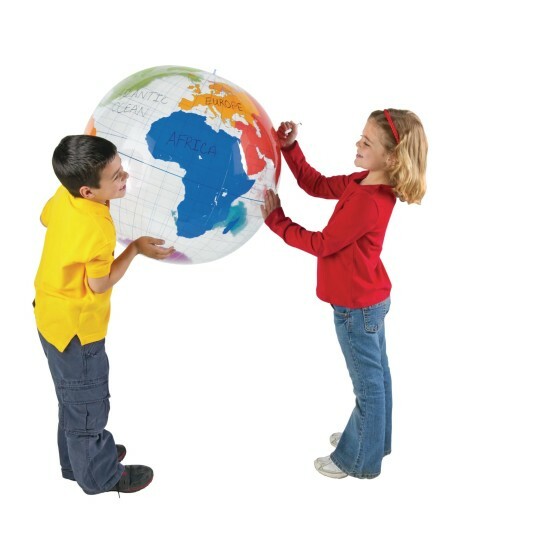 Invent your own world-wise tossing games with this giant 27" write-on/wipe-off globe. Customize it to enrich geography, history, literature and social studies lessons. Locate and label continents, bodies of water, countries, trade routes and more. Features no printed words -perfect for assessments. Includes repair kit, activity guide, plus hook and string for hanging. Use with wet-erase markers. Grades K+.